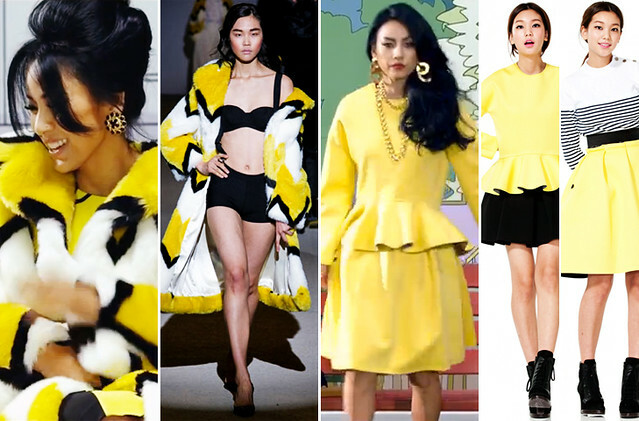 In Lee Hyori (이효리)'s latest music video, 'Bad Girls (배드 걸스)', she was seen wearing a yellow patterned fur coat from pushBUTTON Fall/Winter 2013 collection. You may remember seeing the same coat on actress, Gong Hyo Jin (공효진) at Seoul Fashion Week. Later in the music video, she was seen wearing a yellow peplum ensemble from Lucky Chouette Spring/Summer 2013 collection. Gold accessories and a pair of black studded sandals (not seen above) to complete her look.